Jeff Coffin & the Mu'tet dip into a deep musical well with this astonishing new studio recording - presenting memorable, accessible, and sometimes haunting, original compositions influenced by diverse cultures of music from around the globe. 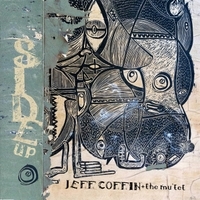 JEFF COFFIN, saxophonist of Dave Matthews Band - and 3x Grammy Award winner with Bela Fleck & the Flecktones (1997-2010) – mu’tates once again with his unclassifiable, genre smashing, all-star band, JEFF COFFIN & the MU’TET, on their new Ear Up Records recording SIDE UP. In the Mu’tet are some of the finest musicians on the planet. Fellow Flecktone & 5x Grammy Award winner ROY ‘FUTUREMAN’ WOOTEN on acoustic drums, FELIX PASTORIUS (bassist with the Yellowjackets & son of Jaco Pastorius) on electric bass, BILL ‘THE SPACEMAN’ FANNING on trumpet & space trumpet & CHRIS WALTERS on acoustic piano, Fender Rhodes, Wurlitzer, Hammond B-3 organ & melodica. Joining the Mu’tet on SIDE UP are a number of equally world class, top call, guest musicians. From tabla to tambourine, harp to harmonium, horns to harmonica, this recording embodies Coffin’s musical vision as a bandleader, composer and instrumentalist. Coffin again reaches into a deep musical well with this astonishing new studio recording – and his always accessible, memorable, sometimes haunting, original compositions continue to be influenced by diverse cultures of music from around the globe. All the photographs contained on this project (as well as his previous recordings, INTO THE AIR, MU’TOPIA & BLOOM) were taken by Jeff. The CD artwork on SIDE UP is all street graffiti from Brasil.